Fine prints on canvas by the Dutch master maritine painter, including several vibrant studies of 'Cutty Sark'.... The original paintings are also available. Jan de Quelery was born in 1957 near the Dutch seaport of Vlissingen. It is an old town with a wealth of nautical history dating back to the year 620. 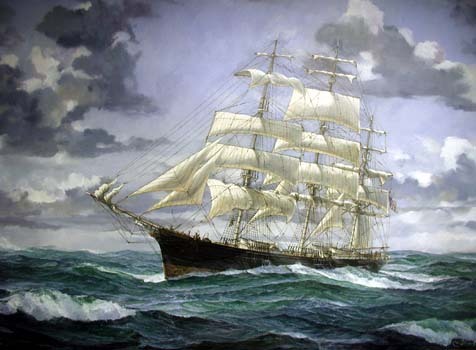 The young Jan had every opportunity to indulge his passion for ships and for the sea. He expressed his maritime fascination by drawing numerous sketches of ships in and around the seaport. His extraordinary gift for painting soon became apparent. Aside from his job at a local shipyard, he spent his apprenticeship in commercial art studios in Holland. Sooh after, the first of his remarkable oil paintings became available to collectors. In the 1980s Jan moved to New Zealand where he began to paint watercolours. In 1989, having returned to his home town of Vlissingen, he made a full-time commitment to painting and nautical research, concentrating on historical subjects ansd ships, usually in a stiff breeze and a high sea. 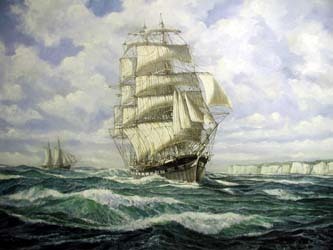 He also published illustrations in leading European maritime magazines on a regular basis. Jan's work has been exhibited world-wide in galleries, museums and international sail events, including the Aukland Maritime Museum, Park Royal Wellington N.Z., Broadway Gallery New York, Sail Antwerp, RAI Amsterdam-Europort and Art Maritim Hamburg/Messe. Jan de Quelery has mastered and carried onward the Dutch tradition of maritime painting, to become one of its leading contemporary exponents.